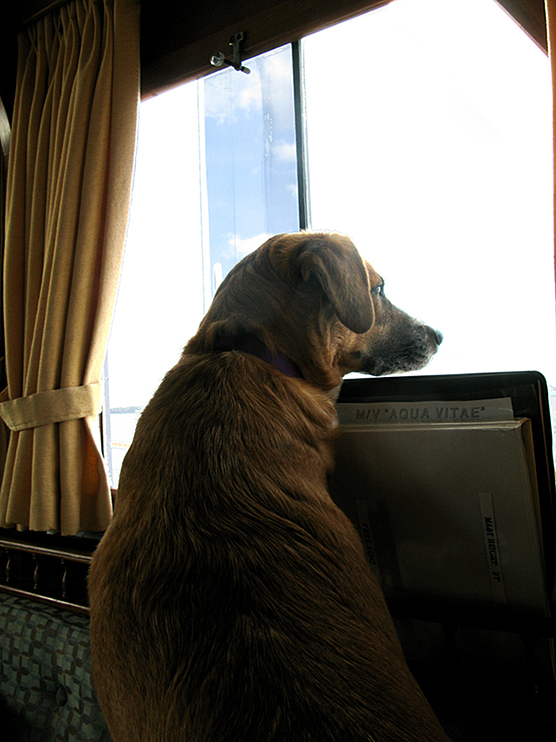 And here is Niya when she’s not standing at the rail squealing: She is very watchful of our wake in case any dolphin come by! 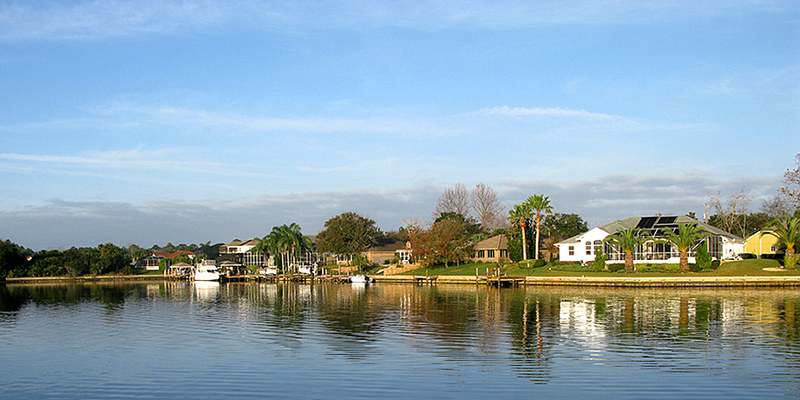 In the meantime, we left the boat for our “holiday evacuation” in Palm Coast, Florida, a beautiful community on the water. Phil and Sarah Lowe are amazing hosts. 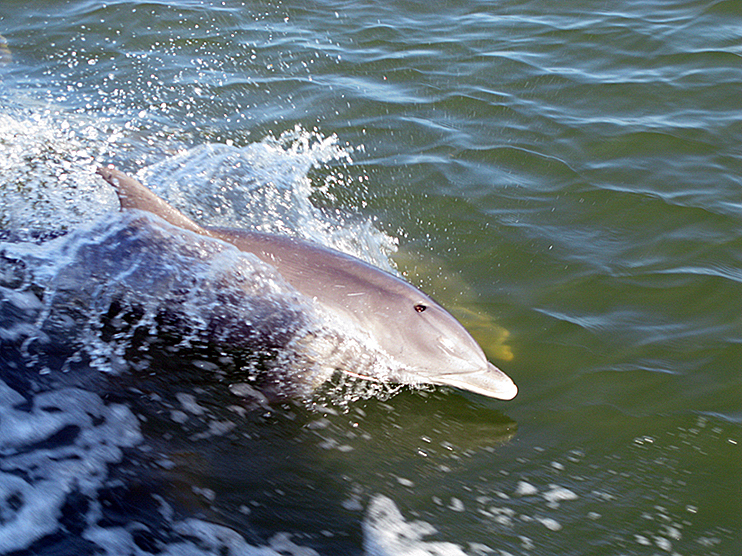 They became our friends very quickly, as the warmth of their welcome goes beyond what “Port Captains” do. To-ing and Fro-ing to car rental places, offers of any and all help and hosting we might need — and when they run out of dock space they enlist their neighbors’ assistance. We were graciously hosted for two weeks by their next door neighbors, and were sad to say goodbye. . . Niya LOVED romping and chasing with their wonderful dogs Maggie and Casey. . . ESPECIALLY Casey, who pretty much equaled her in speed and agility. What a sight that was! 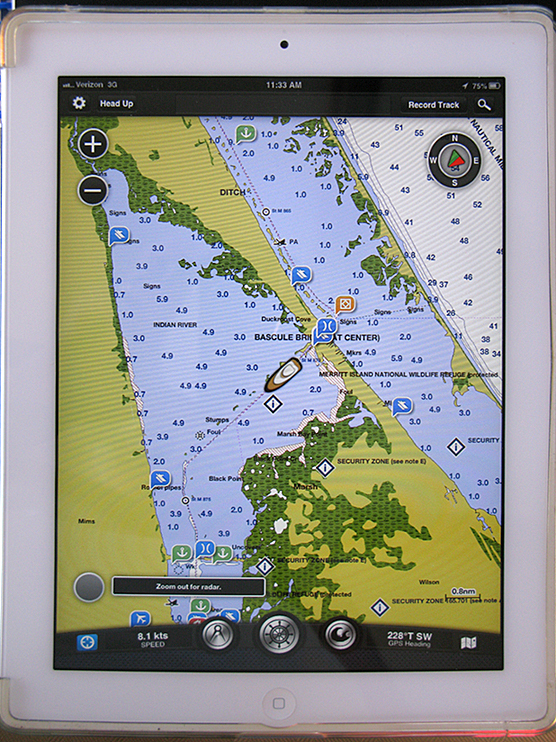 We passed Daytona Beach. 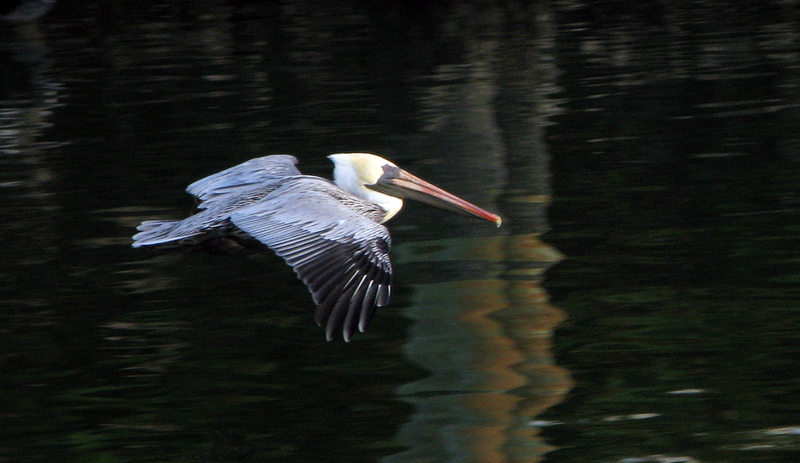 . .
And saw many pelicans. 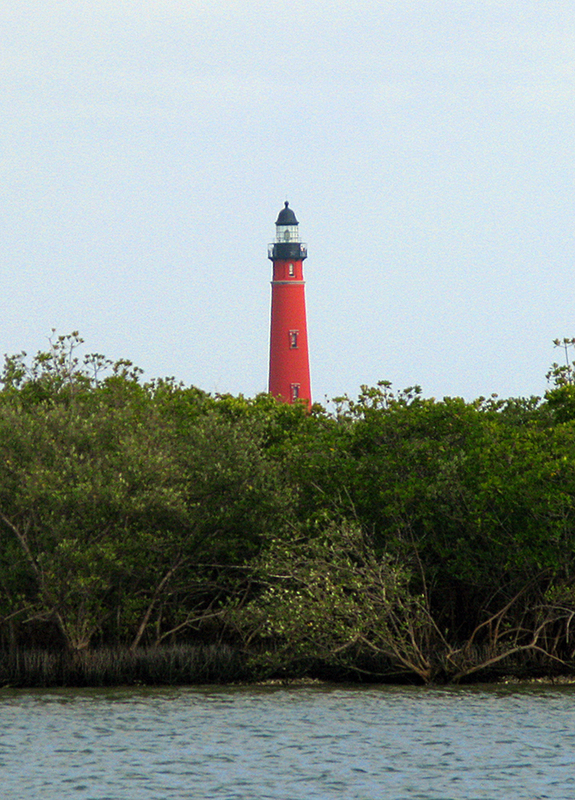 . .
And the Ponce de Leon Lighthouse. 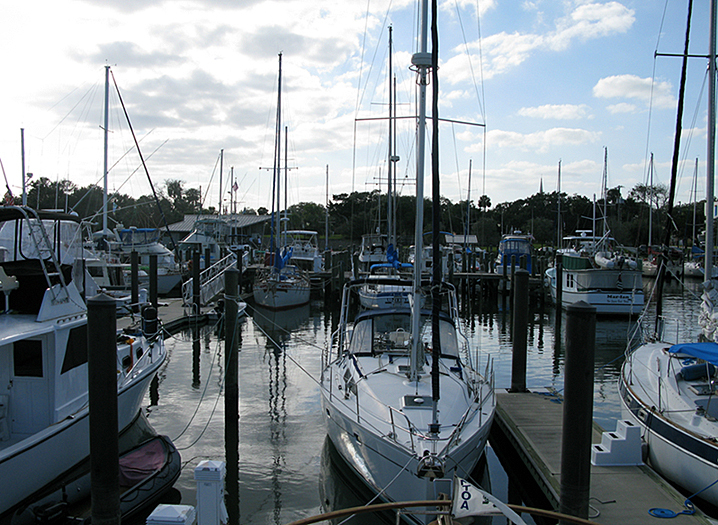 Our next stop was New Smyrna Beach Marina. I think we could have stayed there for the rest of the winter! There is ­­­SO MUCH GOING ON!!! 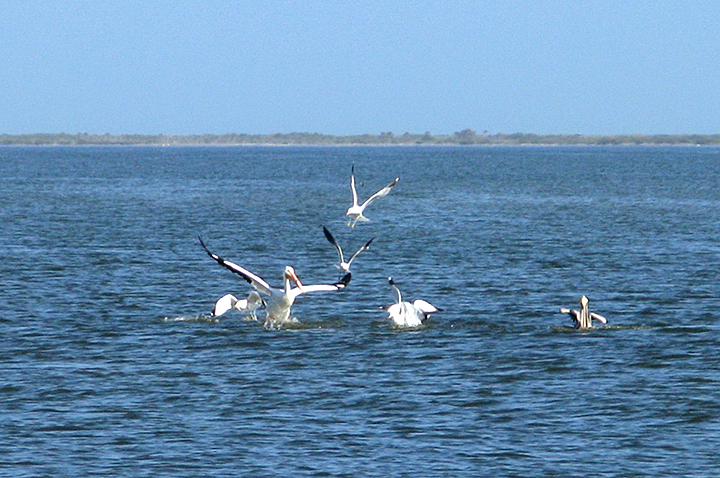 Dolphins, pelicans, deep sea fishermen in COMBINATION with pelicans, what a scene! 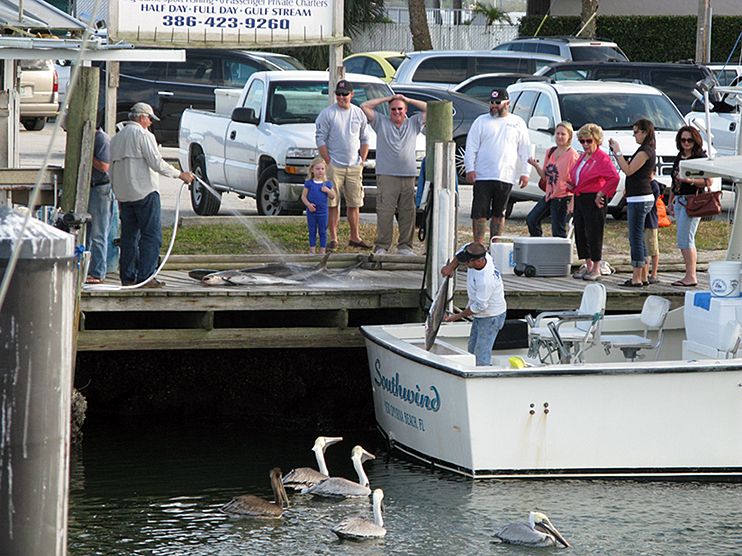 The successful day of fishing started the crowds gathering, both on the dock and on the water. . . 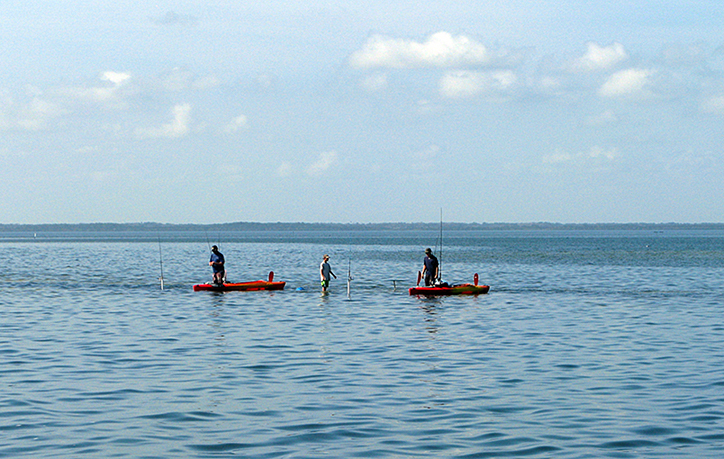 Finally squabbling broke out on the water. . . 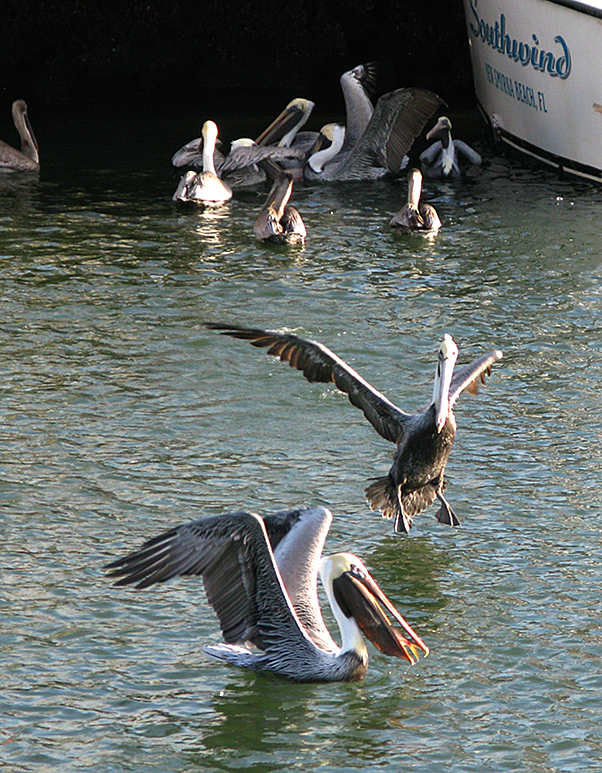 The two small islands just outside the marina were evidently “bedrooms” for the pelican gang. 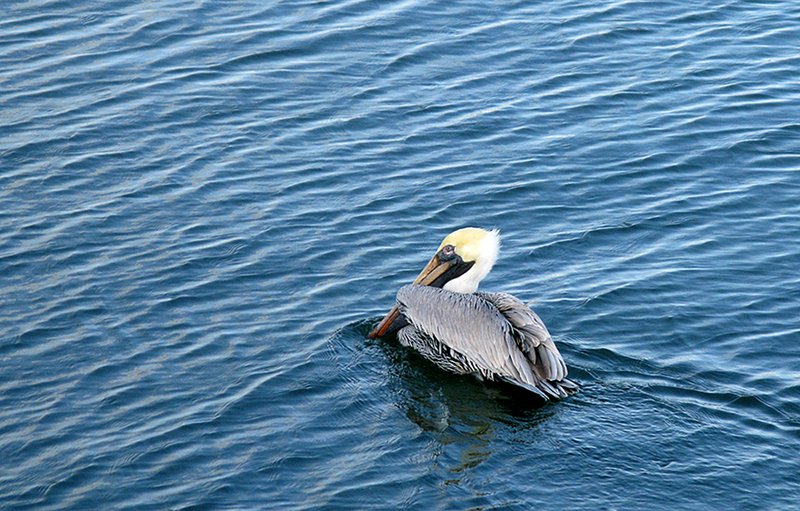 Niya decided that after dolphins, she loves pelicans the best, because they splash when they go into the water. 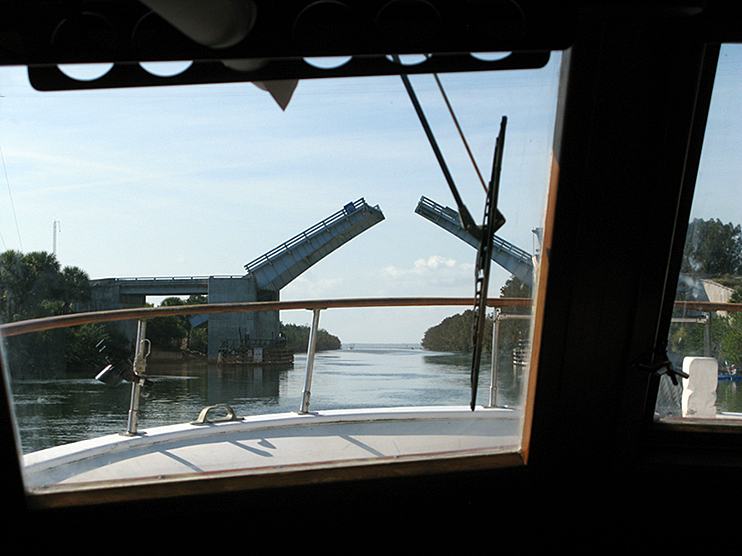 We all had an amazingly entertaining evening on the flybridge. It was the first time that we really felt that we were “here,” wherever that is. 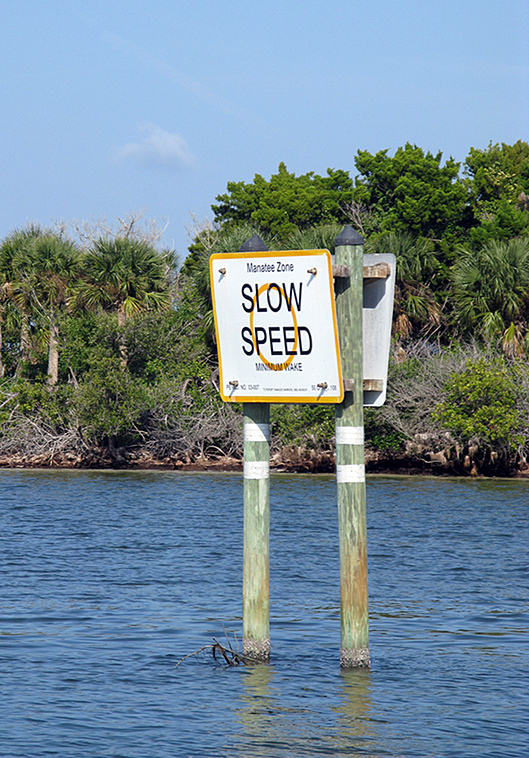 Feet up, warm breezes, hours watching birds, dolphins, water, sunset. . . .
THEN. . . dinner at the restaurant next door, grilled shrimp for me, fish and chips for Hans. It was reasonably priced, well prepared, generous in size, and DELICIOUS! Served on paper plates with plastic utensils, by the way. We really COULD have stayed there forever, but left at 8:30 with a quiet tide, no one about, the deep sea fishermen already gone, the pelicans still sleeping. Interesting to note that while standing or swimming these birds look all white. 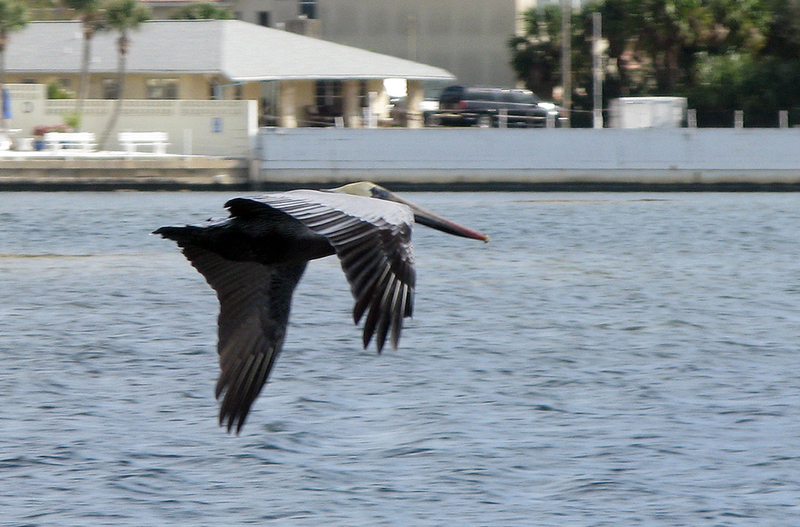 But clearly from the next photo, the wing tips are black. 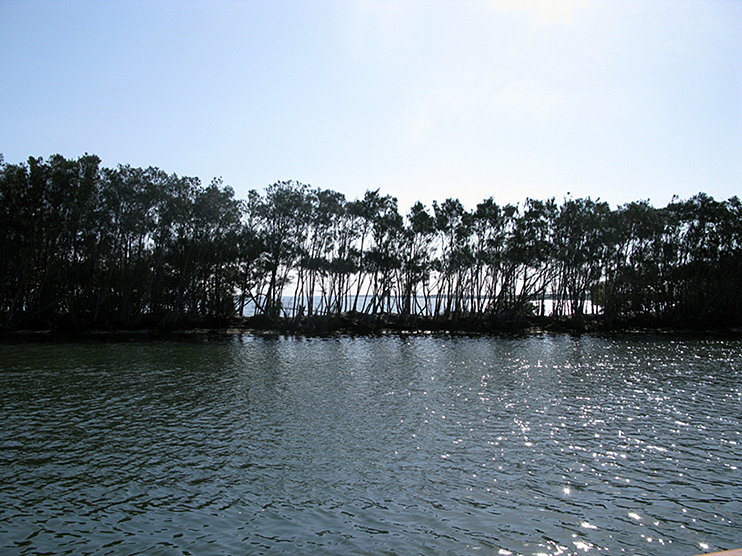 To the east, there is a narrow barrier island separating us from the ocean. Dunes, or not. 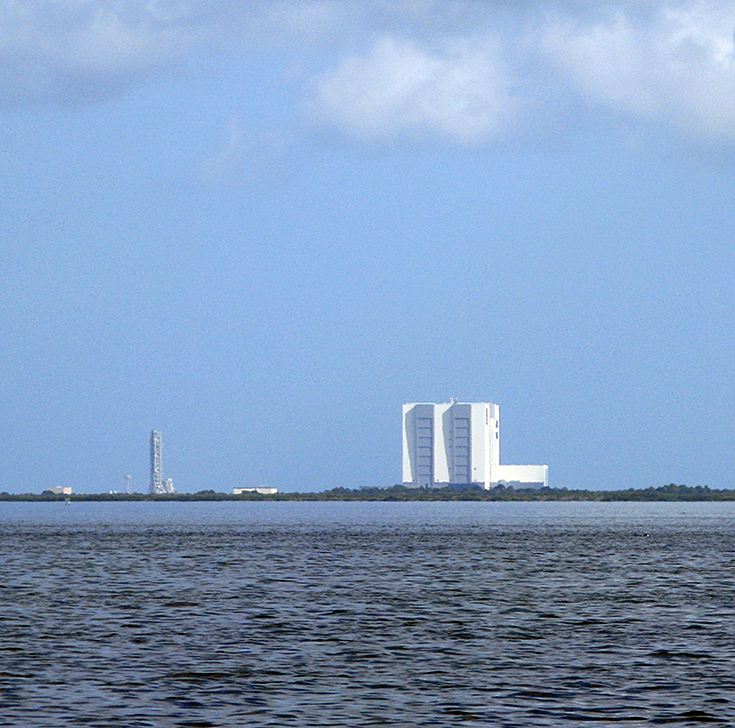 You can see the buildings, and yes, even the launch pad, of NASA! 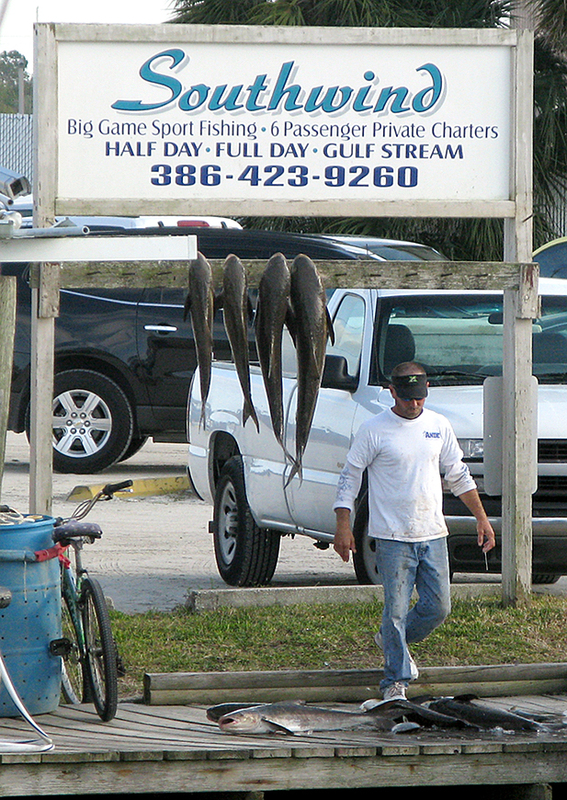 There’s a lot of shallow water, and fishermen take advantage of it. 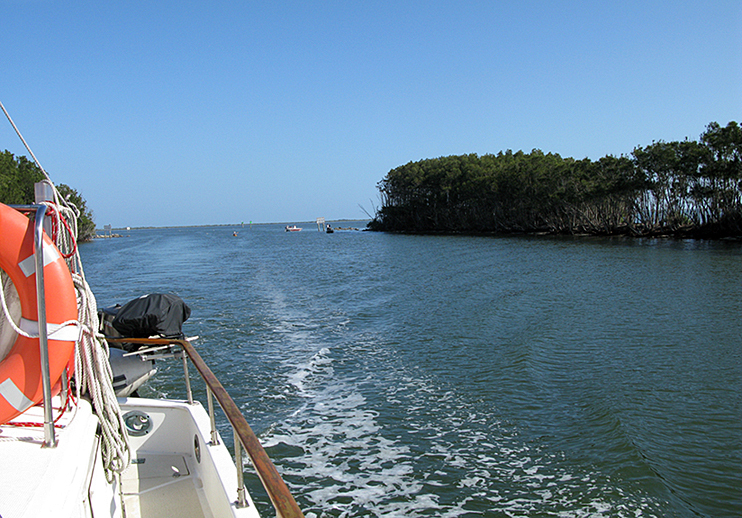 At one point we left Mosquito Lagoon via the Haulover Canal to enter Indian River. 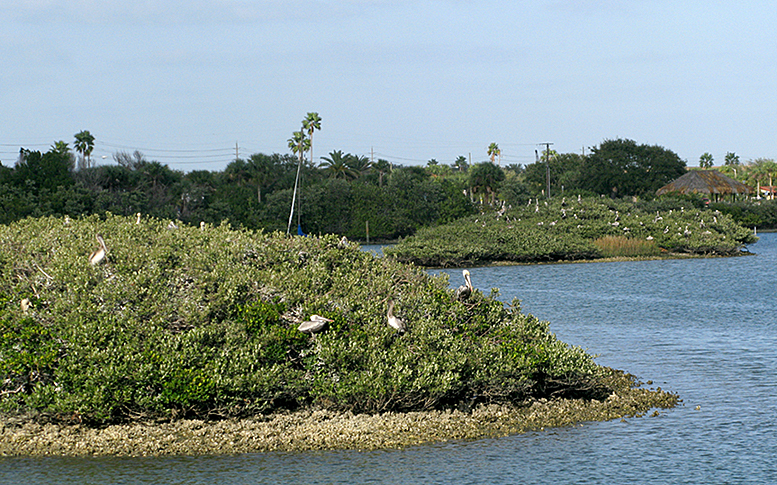 This little canal is just a short cut through a barrier island, and is fishermen’s haven apparently. 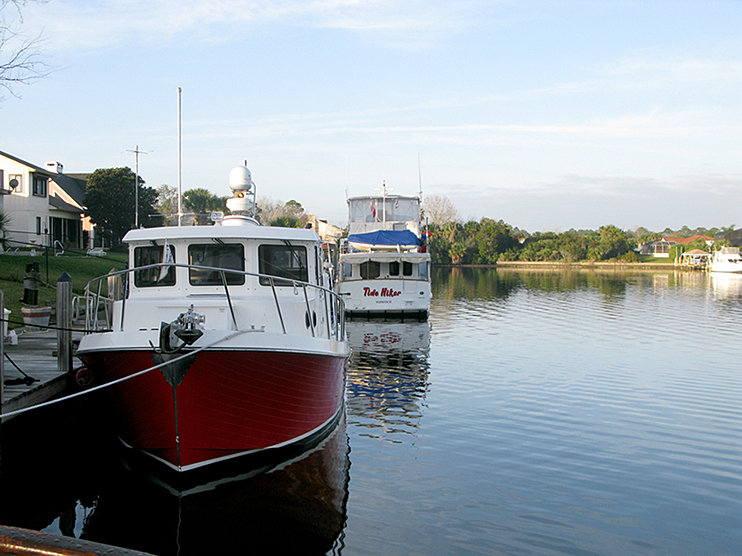 We are at Cocoa Village Marina and will be staying here one more day. The weather turned nasty this morning, cold (yeah, I know it’s relative, but spitting rain, gusty wind and 62 degrees is COLD!) Cocoa Village is a charming area of the city of Cocoa, with many little shops and restaurants. The shops are more interesting than the ones we saw in Fernandina Beach — not as many “flea market” shops. Much like the feel of New Smyrna Beach, this city is less glitzy than many Florida coastal towns. There is a slower tempo, and less intense development. We like it!